Dubai: After a day of wet weather in the UAE on Sunday, the sun will come out on Monday though there are still chances of some rainfall on Monday. 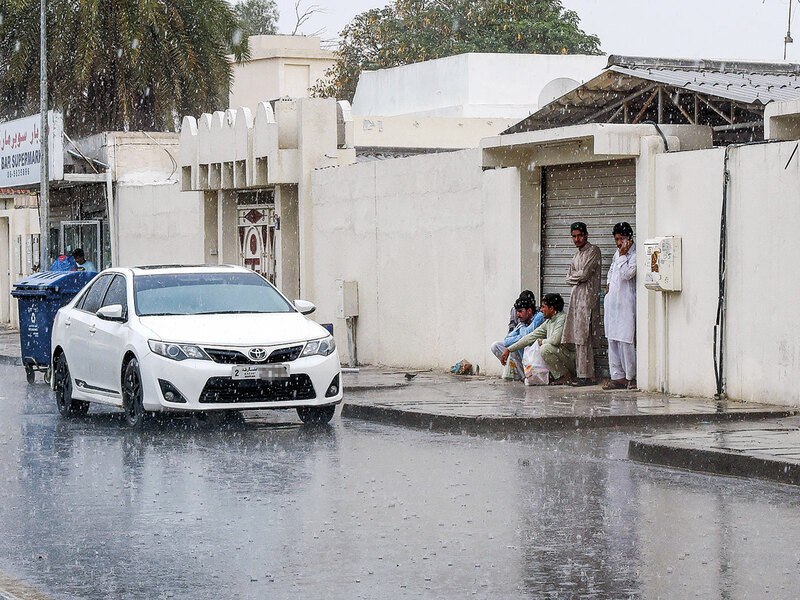 Thundershowers hit Dubai, Sharjah, Ras Al Khaimah on Sunday while different intensities of rain were recorded in Al Hiyar, Emirates Road, Fujairah and Umm Al Quwain on Monday. The weather instability is due to an extension of surface low of pressure over the country and the Arabian Peninsula accompanied with an upper air trough. Visibility was down to 1500 meters in exposed areas due to dust and sandstorms associated with towering cloud formation. On Monday, the northern and eastern part of the UAE will have cloudy skies in the morning, becoming hazy and partly cloudy in general, with a significant drop in temperatures. Fresh Northwesterly winds, with gusts of 50km/h will continue to whip up dust and sand across exposed areas. No more rain is expected on Tuesday although dusty conditions may still prevail. The sea will very rough to rough in the Arabian Gulf and rough in Oman Sea on Monday while both will be rough on Tuesday. No casualties were reported in the incident. Brigadier General Abdullah Khamis Al Hadidi, acting police commander in chief of Ras Al Khaimah Police, said that the operations room received a call at 12 noon stating that some concrete segments of the building gave way due to heavy rain. The emergency, crisis and disaster teams, along with police, Civil Defence, ambulance and rescue teams, and the General Service and Red Crescent, rushed to the site and helped residents evacuate safely. The safety of the building is now being assessed, even as residents of the building are being provided alternative accommodation. In Abu Dhabi, motorists have been urged to exercise caution on the roads, slow down and follow traffic safety rules as inclement weather plagued commuters. The Abu Dhabi Police General Command urged drivers to adhere to safe driving, to be vigilant during the dust storm, and to follow safety procedures in such conditions for the safety of all. The police called on drivers on highways to reduce speeds to 80km/h, and keep sufficient safe distance in accordance with the decision of the Traffic Safety Committee in Abu Dhabi during volatile weather conditions. They stressed the need to adhere to the speeds shown on the electronic road signs, which alert drivers to change and reduce speed during the volatile weather. The police also urged motorists to stop on the right shoulder off the road in the event of very poor visibility due to dust. Motorists who stop their vehicles owing to any emergency have been told to use warning signs, and also to operate the lights during poor visibility and pay full attention and not use their cell phones.